Businesses decide and direct what they want for their area. 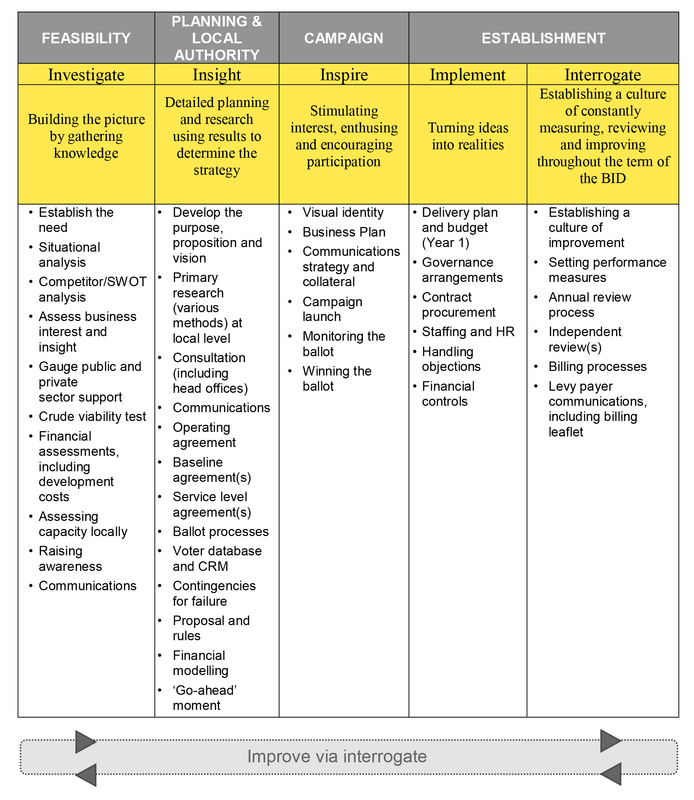 We have developed an i5 stages methodology to BID development for developing and renewing BIDs. The process sets out distinct phases in the development process and progress can be reported following each. The process makes it easier for the BID Board or Steering Group to monitor progress and proceed from one Stage to the next only when the former has been successfully completed and there is confidence to progress. The five Stages are Feasibility, Planning, Local Authority, Campaign and Establishment. Click below to view this in detail. is about setting up a business to deliver, noit simply a BID to win a ballot. encourages a visionary, place-shaping approach to BID development built around a detailed understanding of each individual place, its catchment and competition. It is a knowledge and research led approach which introduces a culture of constant improvement and has evolved from our experience in locations throughout the country. Success at the renewal ballot comes through hard work and experience. The process also involves being able to prove a return on investment to businesses, provide a consultation period on priorities for the next five year term, produce a business plan for term and carry out a formal ballot. We have extensive experience of renewal ballots and strong connections at Head Office level and boast an unrivalled track record at the ballot box. Savills Place provides ongoing BID management support to numerous locations. We have guided all of the BIDs we manage through either a first ballot and/or renewal and are proud to support them. Find out more about these on our clients page. In a nutshell, we work with the structure you have to help maximise the BID delivery. All of our teams have worked in a BID at an operational level so understand all that is needed to create a successful and well­ run organisation. A location can have its own team on the ground if it chooses and and we can support them by providing overarching strategic guidance, governance advice, business planning,marketing and communication planning/strategy, campaign plans, human resource support, recruiting facilities, monthly management and marketing meetings, budgeting and finance resource. Equally we are able to recruit, provide and manage the entire BID team on your behalf if you so choose. We can help you test the BID concept with businesses in your area to see what matters to them and what matters to their business. As we know, every place is different with individual wants and needs. We help you define whether there is an appetite for the BID concept and what potential areas of investment businesses would want to spend their money on. We help you model a potential BID zone and look at in principle what your BID might do. Our feasibility service is the ‘go ­to’ guide for places in the initial stage of developing or renewing a BID. We have a technical support package for developing and renewing BIDs and is a good example of how a consultancy should provide a clearly defined project with a clearly defined timeline and a clear definition of success. The i5 stages is incorporated into the remote support package . It will guide you through Feasibility, Planning, Local Authority, Campaign and Establishment. Each of these stages require knowledge, solutions and must progress at the required pace. Each location poses its own unique challenges which can come from leftfield, but this package provides the assistance and reassurance that these can be overcome. This package provides a solution for locations who have established on-site teams but require off-site technical support throughout these stages of developing or renewing a BID. As often as required, help, advice and practical assistance is available to guide through each of the i5 stages from a dedicated Manager who is the primary point of contact as well as the experienced wider team when required.